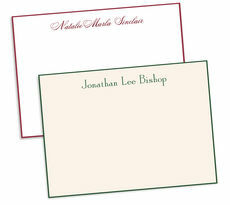 Sample shown in ELRL typestyle using First and Full Name Personalization. Sample shown in EBHN typestyle using First and Full Name Personalization. 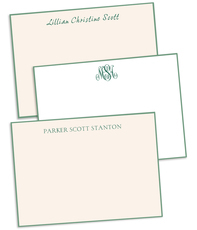 A very today color surrounds the border of our white cards creating a fun yet sophisticated look. 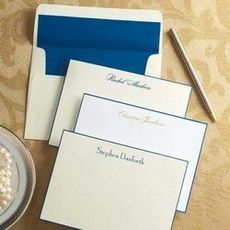 Card size is 6.25" x 4.5". 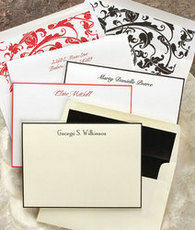 Borders are applied by hand and your personalization is featured in your choice of raised ink. 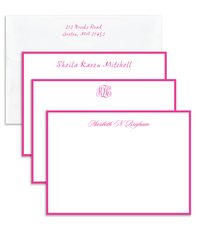 Printed return address on envelopes is also available. Upper-lowercase typestyle and positioning only as shown.